Beat stress and fatigue with a rejuvenating session of sound meditation at Om Studio in JM Road. The ancient practice of sound healing has an instant relaxing effect to mind, body and soul. At Om Studio, the meditation sessions are combined with Tibetan singing bowls. 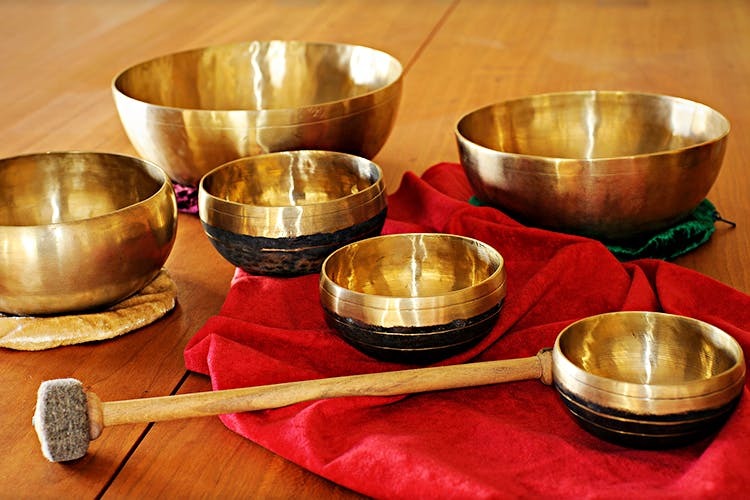 The vibrations from the singing bowls reduce insomnia, stress, blood pressure, anxiety and improves mental and emotional clarity. The sound meditation sessions are conducted by Rinul Pashankar, a certified sound healer from Kailash Tribal School of Yoga and Healing and the International Academy of Sound Healing. The therapy incorporates multiple sound frequencies to treat your mind and calm your body. The soft yet distinctive sounds envelope you immediately, making you feel light and happy from within. The Tibetan Bowl therapy helps in stimulating the immune system, lowers your anger levels and relieves you of pain. If you’re looking for positivity and inner stability, we highly recommend you to attend one of the sound mediation sessions. Om Studio conducts group and personal sessions for 10 or more people. You can either take a membership of 3 months for INR 6,000 or for six months for INR 9,000. Corporate lives can take a toll on our health. Strike a balance somewhere and enroll for a Tibetan bowl therapy at Om Studio.